Good old geothermal plants generate power using water heated by hot rocks deep underground. But what if we could get energy directly from the seething magma down below? In Iceland, an accidental discovery let scientists actually stick a pipe into magma to test this idea—and the results of their experiment has just been published in the journal Geothermics. As a land of volcanoes, Iceland already gets a third of its electricity and 95% of its home heating from the geothermal energy underground. Four years ago, geologists and industry reps from the Icelandic Deep Drilling Project (IDDP) were working on exploratory wells for an ordinary geothermal power plant when they hit trouble. After just 1.3 miles of drilling, a pocket of magma flooded their well. Now, it's quite rare for molten magma to flow so close to the earth's surface, which is a big reason energy from magma had been deemed impractical. But this discovery got the scientists thinking... and tinkering. They cemented a steel pipe into the magma-filled well and poured in water to create superhot steam. 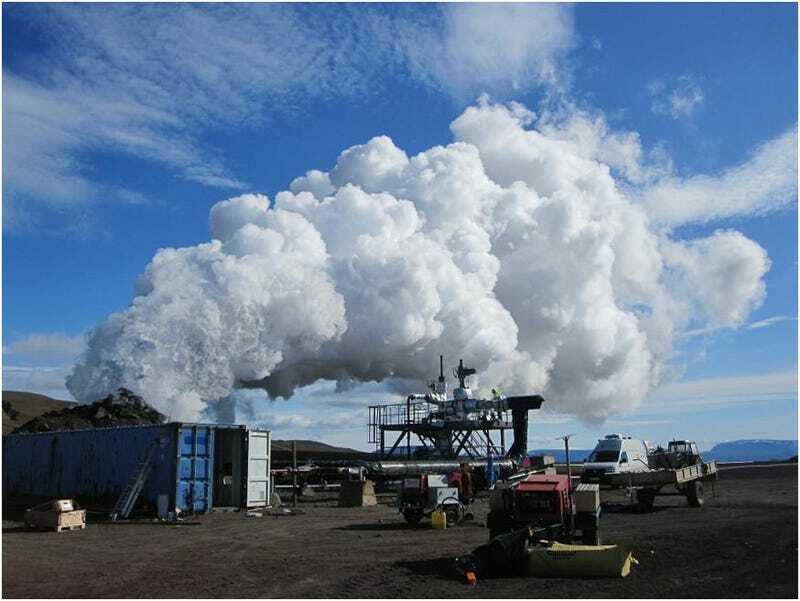 The high-pressured, 840º F steam could produce as much as seven times the energy as that from an ordinary geothermal well, the study's co-author, Wilfred Elders, a professor emeritus of geology at the University of California, Riverside, told Livescience. The steam, which flowed for months, was also the hottest ever recorded from geothermal heat. A system that could control molten magma was quite an engineering feat on its own, but there are, of course, the usual caveats before anyone gets magma electricity. While the well produced steam, it was never connected to a power plant to generate electricity, and some equipment problems forced the well to be abandoned. The scientists hope to drill another well to continue their experiments.